My good friend Georgette is not the only one who reads the satirical newspaper The Onion. I'm sincerely hoping that God does not read it or at least skips the horoscope section because a few weeks ago my horoscope said, "You've always wanted to become a local legend, so please enjoy your fame as The Guy Who Smoked at the Gas Station and Everyone in the Next Town Thought Was a Meteor." I wouldn't mind being well-known but not at the price of becoming a human Roman candle. The characters in the following books may not share my astrological sign but they still achieve local fame in rather meteoric ways. "Tran, Tran, and Hok broke through the heavy end-of-wet season clouds. The warm night air rushed against their reluctant smiles and yanked their hair vertical. They fell in a neat formation, like sleet. There was no time for elegant floating or fancy aerobatics; they just followed the rusty bombshells that were tied to their feet with pink nylon string. "Tran the elder led the charge. He was the heaviest of the three. By the time he reached the surface of the Nam Ngum reservoir, he was already ahead by two seconds. If this had been the Olympics, he would have scored a 9.98 or thereabouts. There was barely a splash. Tran the younger and Hok-the-twice-dead pierced the water without so much as a pulse-beat between them. "A quarter of a ton of unarmed ordnance dragged all three men quickly to the smooth muddy bottom of the lake and anchored them there. For two weeks, Tran, Tran, and Hok swayed gently back and forth in the current and entertained the fish and algae that fed on them like diners at a slow-moving noodle stall." So begins The Coroner's Lunch by Colin Cotterill. These poor tortured Vietnamese soldiers fall into the Laotian lake like meteors without the blaze. When their bodies are discovered, however, they will provide the new national coroner of Laos with a flaming headache. Tran, Tran and Hok have the potential to become an international incident. It is 1976, a year after Communists came to power in Laos. Siri fought with the Communists out of love for his wife but when the fighting was over he expected to retire. Unfortunately, doctors are in very short supply and the reluctant Siri is drafted to become coroner. He has no formal training in performing autopsies and there are few supplies, textbooks or assistants to help him. Yet Siri goes about his business. Hacking through red tape and cover-ups, Siri tackles the suspicious death of a local Communist leader's wife, the surfacing of the Vietnamese soldiers in the lake and a series of deaths in northern Laos. 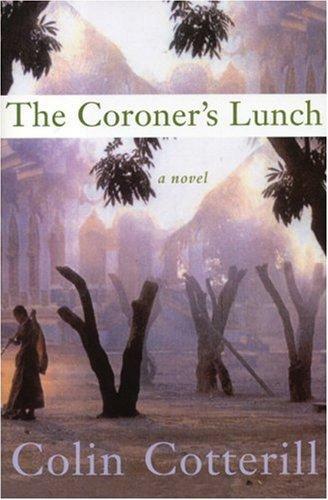 The Coroner's Lunch is the first of a seven-book series. It's an unusual series in many ways: the exotic Southeast-Asian locale, a look at life under a Communist regime in the 1970s, an irreverent coroner protagonist in his 70s and the combination of serious and farcical writing. Cotterill employs vivid imagery and unique characters. He is respectful of Laotian culture and traditions while skewering bureaucrats and finding humor in life's tragedies. If an outlandish plot element occasionally strains belief or one plot thread is weaker than others, it really doesn't matter. This series is a great find and Cotterill's books only get better: Thirty-three Teeth (Siri must identify some badly charred corpses, investigate a creature killing people in the capital and explain why citizens are falling to their deaths from a ministry building) and Disco for the Departed (Siri investigates a corpse entombed in cement at the former home of the President in remote Vieng Xai) are wonderful. Next month, readers get a timely holiday present because Soho Press will publish Cotterill's Slash and Burn. I can't wait. One of these days I'll visit Southeast Asia but for now, I'll read about Dr. Siri Paiboun. Our next local legend is Sovereign of the Deep Wood, who is "the approximate size and shape of a snow blower." He is a wild boar, the town mascot in Nancy Mauro's debut, New World Monkeys. The boar is owned by Skinner, a man you'd rather not cross, so it's not an auspicious beginning to life in the fictional town of Osterhagen, New York when Lily and Duncan's Saab collides with Sovereign of the Deep Wood as they arrive in town. Tellingly, Lily attempts to grab the Saab's steering wheel away from Duncan moments before impact and then mercifully kills the severely injured boar with the tire iron when Duncan can't. Duncan and Lily are only in their early 30s but they fight with the zeal of a couple who's been incarcerated for a lifetime in a flamboyantly unhappy marriage. When Lily inherits an old Victorian in upstate New York, she and Duncan see this as an opportunity for change. Lily can get moving on her Ph.D. dissertation in pre-Renaissance architecture while Duncan commutes to his job at a Manhattan ad agency. Things are bound to look up personally and professionally. And pigs, like meteors, can fly. This is an eccentric book containing eccentric characters (including a sexual deviant), an eccentric plot (including a backyard grave) and eccentric writing (I've never seen so many adjectives, similes and metaphors in one book in my life). The characters are for the most part unlikeable even though I empathized at times with all of them. Mauro's writing is imaginative but so stuffed with sentence modifiers it nearly bursts at the seams. This book isn't for everyone, certainly not for people searching for stripped-down prose and a speeding plot. I did have fun reading it and I suggest it to someone who likes black humor and satire and is looking for a book by a creative new writer. I'm glad to hear Mauro is working on her second novel now because I plan to look for it. Meanwhile, I can take heart from avoiding a fiery (or other) demise. My most recent horoscope is more promising: "You may not be an expert on which snakes are poisonous and which aren't, but damn it, you know a cuddly one when you see it." You're darn tootin', I do. I really enjoy the Dr. Siri books. The series continues to educate with each edition as you say. I was studying too much in the seventies to be totally aware of all that was going on in the world around me and probably would have gotten a skewed view of the reality of it at the time anyway . Some times history is better seen from the distance of time and the wisdom of age. It is nice to hear there is another volume on the way! 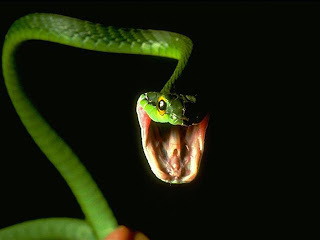 I have never seen a cuddly snake, I never hope to see one, But I can tell you any how, I'd rather see than be one.